Markets end flat; Nifty holds 8,250. Markets are in consolidation mode, as benchmarking indices closed flat thus surviving China scare. Shanghai stocks posted biggest fall. Mumbai: Markets are in consolidation mode, as benchmarking indices closed flat thus surviving China scare. Shanghai stocks posted biggest fall. The markets were dragged down by bank, pharma and capital goods sectors on Wednesday. 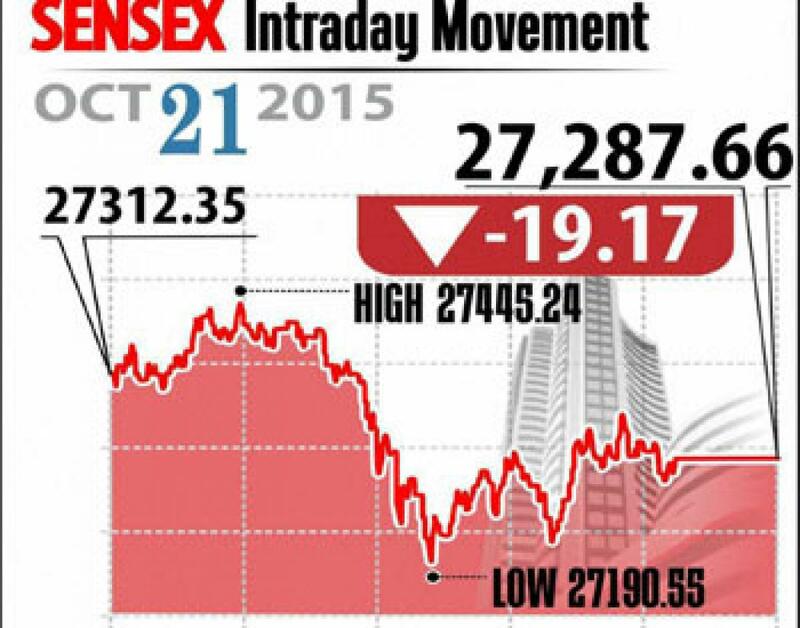 Sensex closed lower by 19 points at 27,288 and Nifty ended down by 10 points at 8,252. Meanwhile, broader markets also fell with midcap and smallcap indices down between 0.1 per cent and 0.4 per cent. The markets will be closed on Thursday, October 22, on account of Dasherra. On the sectoral front, the realty sector index closed lower over 2 per cent, followed by bank, capital goods and healthcare indices, which are down by about 1 per cent each. Even as the HDFC Bank reported 20 per cent raise in the net profit for the Q2 thus meeting the investors estimates, and also net-NPA also down to 0.25 per cent, the bank's stock closed flat. The Bank Nifty fell by 0.7 per cent. However, auto stocks reported positive with Bajaj Auto gaining over 3 per cent as the company reported better earnings. Hero MotoCorp closed 0.5 per cent higher, on the other hand, Maruti ended down nearly 1 per cent. The top losers included Dr Reddy's, SBI, Sun Pharma, ICICI Bank and GAIL, and gainers include Bharti Airtel, Tata Steel and NTPC. The gainers: Vedanta, up 3.75 per cent at Rs 105.05; Bajaj Auto, up 3.28 per cent at Rs 2,518.25; Bharti Airtel, up 2.70 per cent at Rs 371.45; Tata Steel, up 1.66 per cent at Rs 244.80; and NTPC, up 1.64 per cent at Rs 129.90. The losers: Dr Reddy's Lab, down 3.30 per cent at Rs 4,172.95; GAIL, down 2.10 per cent at Rs 319.25; State Bank of India (SBI), down 1.87 per cent at Rs 249.70; BHEL, down 1.77 per cent at Rs 208.25; and Larsen and Toubro (L&T), down 1.44 per cent at Rs 1,550.35.